Pavey Ark is really the name of the crags at the eastern edge of Thunacar Knott, but it is more usual to treat it as a separate fell. This is partly because it forms such an impressive part of the Langdale Pikes and partly because of Jack's Rake, one of the most dramatic routes up any Lakeland Fell (and really better suited to the climber than the walker). Pavey Ark is only visible from the south and east, where its massive crag forms a key part of the skyline of the Langdale Pikes. From behind it simply appears to be the edge of the larger fell, and makes no real impact on the landscape until the summit rocks are underfoot. Pavey Ark can easily be reached from any of the other Langdale Pikes - take your pick of the many paths that run behind the Pikes. Direct ascents all start from Stickle Tarn. The most famous route up is Jack's Rake, which runs diagonally from bottom right to top left across the crag. This is a hard scramble or easy rock climb, depending on your attitude and level of technical skills. Personally it isn't for me, with big drops and scrambles in awkward places. One alternative route take advantage of a grassy gap in the crags between Harrison Stickle and Pavey Ark - head left of Stickle Tarn and look for the slopes. 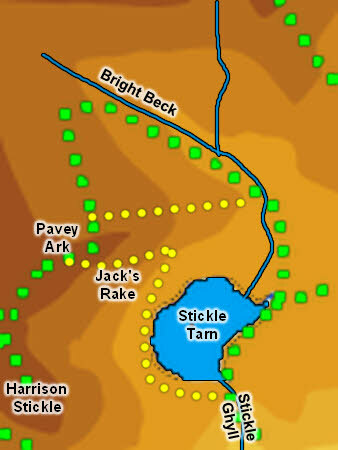 The second alternative is Wainwright's North Rake - a clear path follows Bright Beck up from Stickle Tarn then crosses the beck and runs up a grassy grove that climbs a fairly easy ridge north of the crags of Pavey Ark. The summit of Pavey Ark is a fascinating area of rock with patches of grass and small tarns dotted around. The main boundary of Pavey Ark is formed by Bright Beck, which runs around its northern end to flow into Stickle Tarn, and then by Stickle Tarn itself. A couple of nameless becks rise behind the fell and flow north into Bright Beck and there are small nameless streams that flow down the gap with Harrison Stickle. Stickle Tarn sits below the crags of Pavey Ark. There are also a large number of small nameless tarns scattered across the summit.